Welcome to our list of the top free things to do in Florence, Italy! Florence is a walking town, and we’ve spent many days and nights exploring forgotten alleyways, peering into cafes, and concocting stories about what happened behind closed gates and tall walls. We’re also always on the lookout for free museums, haunted gravesites, and Tuscan hikes to strike from our bucket lists. These activities don’t cost a thing – except for the 2-euro gelato or birra we reward ourselves with at the end of a long excursion. Plus, we experience much more of the city than we would just sticking to a standard script. Our wanderings inspired us to create this resource to help students and budget-minded visitors discover Florence (and Italy!) without reaching deep into their pockets. Which brings us to our latest adventure – sharing our favorite walks, “crawls,” and places with you! We’re happy to have you with us. If you’re new here, we recommend this roundup to help you get started. Have any questions? Just ask us in the comments. All written content and many photos are our own. If you’d like to quote or use them, please do! Just be sure to link back to our site. Photos that aren’t ours have been captioned and linked to their owner; simply hover over or click to see. We believe in protecting original content! In legal talk – ©Florence for Free, 2012. Unauthorized use and/or duplication of this material without express and written permission from this blog’s author and/or owner is strictly prohibited. Excerpts and links may be used, provided that full and clear credit is given to Florence for Free with appropriate and specific direction to the original content. Great idea ladies!! Good luck to you in this adventure! I’m sure it will be a successful one! Ciao!! Really enjoy reading about one of our favorite cities. 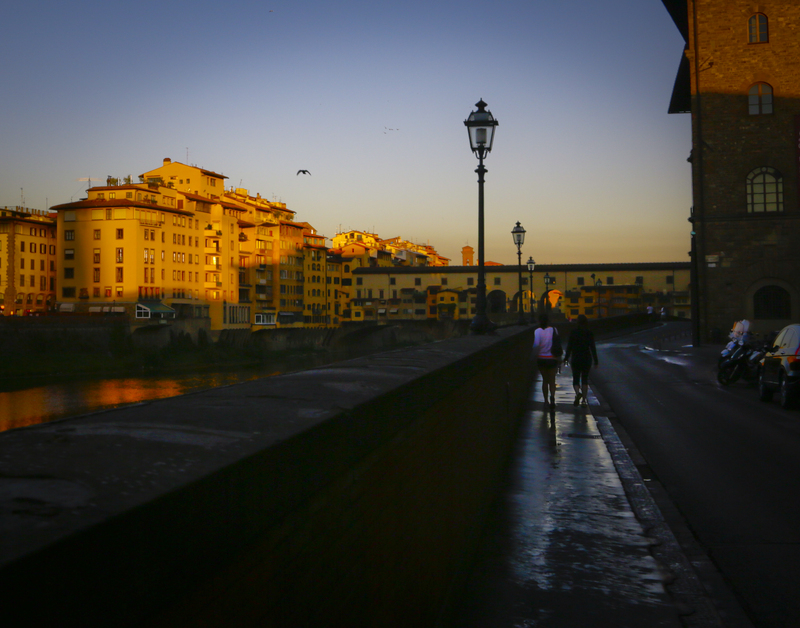 We travel to Firenze each November for Thanksgiving, and stay at the B&B in Piazza della Signoria. It was fun to “walk through Florence” this morning! LOL! thanks susan! glad you took the walk with us. let us know if there’s ever somewhere in particular you’d like to go! Just a quick note to let you know about Florence Writers (www.facebook.com/florencewritersitaly), a new writing group in Florence. It aims to support and encourage writers in the city through talks, events and workshops but hopefully, and more simply, a way for writers and book lovers to get together for a bit of a chinwag! The inauguration is on the 16th September with a book presentation of Ghana Must Go by Taiye Selasi – hope you can make it. I would love to talk to you about possible future events, so if you could email me that would be fantastic. Oh and last but not least, great blog! mundy! we’re psyched to hear about Florence Writers – facebook messaging you now! I absolutely enjoyed reading about your experiences wwoofing in Tuscany. I’m a student travelling though Italy and I will be in Tuscany for a week or so. Could you suggest any farms that would offer accommodation in exchange for work? I didn’t have much success with wwoof Italia and i’m looking for other alternatives to get in touch with farms. Hi hari! Unfortunately we are on the road and struggling with poor Internet, but we will look into it as soon as we are back! Good luck with your travel plans! hi hari! did you straighten your farm situation out? we’re still feeling that wwoof Italia is the way to go…what issues are you running into with them? Hi, in Rome many of the museums offer free admission to EU citizens. Is that the case in Florence? If so, where can I find out which museums do and which ones do not offer this. hi ed! the case for many of the major museums in Florence is that EU citizens under 18 or over 65 enjoy free admission. EU citizens ages 18-25 usually enjoy discounted admission. the sorry lot of us in the middle, however, usually have to pay full price for a ticket. prices always differ for each museum, so you’d have to check each one’s website for specific information. and always check back here to see if there are free museum days when you’re in town! Congratulations on making the shortlist for Italy Magazine’s Best Travel Blog! Glad to have found your blog!! Grazie mille Margie! Same goes to you and your beautiful blog! In bocca al lupo! Great post and great site. Love it! thanks so much jean-pierre! and extra special thanks for reblogging our day itinerary. we know it isn’t for the faint of heart, but it’s good for someone who’s up for a challenge. besides, who says you can stay put at any stop on the way for the rest of the day? take care! isn’t girl in florence the best! we’re so happy to you stumbled onto our site. we’re pretty smitten with you, too! first, congrats on your wedding! and now it sounds like an excellent honeymoon you’ve got yourself there. in addition to the august event line-up (https://florenceforfree.wordpress.com/2014/07/31/upcoming-events-august-2014/), we’d also point you in the direction of our 12-hour itinerary (https://florenceforfree.wordpress.com/2014/01/17/walking-tour-florence-in-a-day/) which will take you by many of our favorite spots in florence. let us know how your visit goes. buon viaggio! Your blog is really nice! Great job! thanks so much diana! glad you found us. I need to send you a mail. Can you kindly contact me? I’m so glad I found you! Here at home we usually joke and say our best memory of Rome is the one day trip we took to Florence, last year. Definitely will go back and take my time, since we are fans of slow travel and detours, so your tips are just what we’ll need! glad you found us as well sandra! we are loving tripper too! and agreed, slow travel is the way to do it!